Artificial inoculation of maize germplasm at the MLN screening site in Naivasha, Kenya. Photo: B. Wawa/CIMMYT. The first screening activity for the 2017A planting cycle from March to May is set to begin in May 2017 at the joint Kenya Agricultural and Livestock Research Organization (KALRO)–International Maize and Wheat Improvement Center (CIMMYT) maize lethal necrosis (MLN) artificial inoculation screening site at Naivasha, Kenya. Deadline for interested private and public sector organizations to send their maize germplasm for screening is March 30, 2017 to enable processing imports and clear seed shipment that takes between six to eight weeks. Planting is due to start at the first week of May 2017. 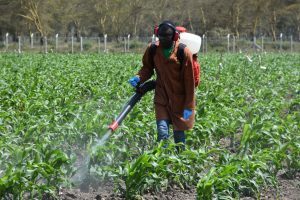 Since its establishment in 2013 as a response to the MLN outbreak, the screening facility has so far screened over 60,000 entries from 16 private and public institutions including seed companies and national research organizations in Africa and beyond. The facility was established with support from the Bill & Melinda Gates Foundation and the Syngenta Foundation for Sustainable Agriculture.